Mr Waldron cut his wood into firebox lengths, at about half past ten each night by the light of a hurricane lantern. After a hard day’s work and riding home seven or eight miles on a bike, he often fell asleep after tea on the sofa near the stove. After that short nap, he’d go for the axe and knock up enough wood for his wife’s use next day. But it was this other sound especially in the summertime of a dipper being filled at the rainwater tank that got me. Three times on occasions some nights. I knew it was George because every now and again he’d cough his real smoker’s cough and I could imagine him there, taking out the makings and rolling a smoke with those big brown calloused hands. I wish you could have seen those callouses. Thick hard skin across his palms and especially the skin ring from the top of his thumb to the first finger tip, where he held the pitchfork or the shovel and his axe and crowbar. I’ve seen him strike a match, light a cigarette, then hold the match until it burnt itself out against his thumb without flinching. And he butted his cigarette one day between thumb and finger, finishing it off in the palm of his hand. He was one tough hombre Mr Waldron but this dipper business puzzled me. He certainly wasn’t the sort of bloke who watered the flowers. You could have blown me over with a feather. Drinking the stuff! Three dippers full some nights and maybe a fourth, because he drank again after he cut the wood. I’d lose count, as he took a while between dippers. I’d be about to fall asleep and the tap would go again and I’d forget what number I was up to. He reminded me of a camel filling his hump with water ready for the next day. There was no hump though, I can tell you that, I’ve seen him stripped to the thick grey flannel he wore, getting ready for a hot bath in their ‘life buoy’ smelling bathroom. Straight across the shoulders there was no hump there besides, Wal, his second son would have told me if he had one. We were good friends. It took five men to work the press, two pitching hay onto a platform, a man on that platform feeding the hay into the path of a sliding horizontal plunger and two others tying wires between the cleats on a board which determined the correct length of the pressed bales. The last man stacked the bales, drove the sweep and horse raked the heap site at the finish so that none was wasted. He was a general roustabout. I worked as a pitch forker with George Waldron and marvelled at his strength and ability. By watching him I learned how to fashion hay onto the prongs and not lose any when raising it. I copied his deliberate movements for not an ounce of his energy was wasted; he neither reached too far nor strained off balance as he forked heap after heap of lucerne hay up onto the feeder platform. And the day came when I found him to be a champion in more ways than one. Christmas had passed and we were pressing our second heap on a day which was hot but humid; good weather for baling lucerne. At first I just brushed my hand across my knee but the crawling sensation continued upward. I began to suspect all was not well beneath my trousers. Especially as whatever it was, had shifted closer to where it ought not be. So dropping the long handled fork, I hastily grabbed at my pants, because whatever was crawling there was well into the danger zone. I hurriedly squeeze rolled the intruder, whereupon he decided it was time to defend. The bite was pincer sharp, deep and painful to the extreme. I crouch fled in agony out of sight behind the heap, on fire to my navel and finally, modesty forgotten, dropped all to reveal the culprit, groggy from my squeezing but more than willing to have another go. The farmer-dreaded green black, hard backed ant. I severed the little sod maliciously between my thumbnails head from body. Murderous in mood from distress and pain, I hardly noticed George with tuckerbag in hand had joined me. “Here Norm,” he said, in his deep rasping voice, “I reckoned you’d been bit by one of them hard backed ants. There’s nothin’ worse.” On hands and knees he rummaged inside the hessian bag to finally produce a small cylindrical tin. Handing it to me earnestly he half whispered, “Try some of this Sigma ointment where he got ya, it’s the best there is for bites and stings. I never go anywhere without some in me tuckerbag.” Then left me. I finger nailed the lid clear to reveal a grey soapy substance, which when slathered on the bite brought the sweetest feeling of relief I had ever experienced. The pain subsided almost immediately. It was a miracle, twisting in agony one minute and body-slump relieved the next. Eyes heaven ward, I bathed in the brain clearing moments of wonder. With composure restored I returned to the job, more than a little apprehensive about the result of the ant’s attack. Subsequent furtive inspections through the day however, convinced me the swelling would not affect my future. As I worked on, an even warmer feeling of friendship flowed towards my life saving friend. I thanked my lucky stars I had a man like Mr Waldron to teach me everything he knew and produce that blessed Sigma ointment, just when I needed him to. Born in 1930, Norman Weaver carried on family traditions of farming sheep and growing cereal crops dating back to the 1870s until a tractor accident forced a change of career. 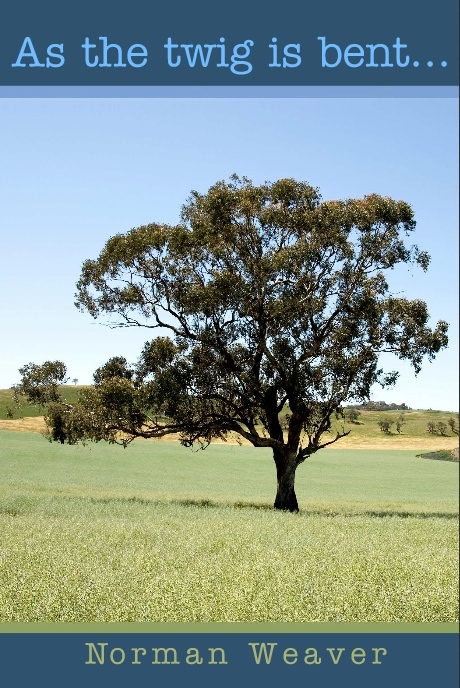 Set on the fringe of the Mallee in Boort Victoria, “As the Twig is Bent …” is a collection of short stories or episodes that the reader experiences through the eyes of the author as a young child, and later as an adolescent who can’t wait to be a man. The stories are captivating, vivid, humorous and prized, not only for the way larger than life characters and situations are brought to life, but for the accurate account of farming life and agricultural history between the world wars, before heavy machinery revolutionised farming practices – at a time when the horse was king!